The Ancients are the ancestors of the Altmer of Auridon, the second largest island in the Summerset Isles archipelago. They are responsible for the various limestone ruins that dot the island. The term is used by the natives to refer to both the early Aldmer and more recent Altmer ancestors. The ruins of Torinaan are named after High Lord Torinaan, an early Aldmer settler from Aldmeris, and are an apparent example of Aldmer ruins. Tanzelwil and Castle Rilis, on the other hand, serve as mausoleums for modern Altmer. Other ruins on the island include Ezduiin, the Buraniim sea-complex, Quendeluun, and the Eye of the Ancients. The term "Ancients" is also sometimes used to refer to the Ayleids on mainland Tamriel. 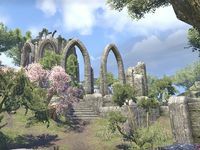 In earlier versions of ESO, conflicting sources described the Ancients of Auridon as not only Aldmer and Altmer, but as exiled Ayleids from Valenwood. This theory was presented in the old version of Auridon Explored, Chapter XII, where Fenlil the Wayfarer asserts that the Ayleids landed on the northern tip of Auridon following the Alessian Slave Rebellion and became the ancestors of the island's Altmer population. A member of the Mages Guild also asserted that the ruins of Ezduiin were Ayleid. These sources conflicted with both established lore and other in-game texts, including earlier entries in the Auridon Explored series. They were later refuted by developers[UOL 1] and ultimately removed from the game during a patch.